Replies: 148 (Who? ), Viewed: 50762 times. #1 1st Sep 2006 at 7:31 AM Last edited by Phaenoh : 10th Feb 2014 at 10:03 PM. This messie lot was owned by an old guy named Jack. Jack was a lonely guy and didn't care much about life anymore. He made an awfull mess of his little house and died by the flies that shared the lot with him. The house is now for sale, but the real estate agent won't allow new buyers to take a look inside.......Can your poor neat freak simmie handle this? 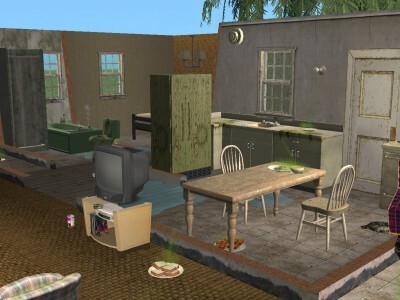 Download messie messplace at The Sims Society at ModTheSims. Move a neatfreak sim in it, with all neatpoints maxed out. The sim may not attend college. Your sim may not get married. He / she has to do it alone. You may use the elixer of life and the thinking cap, nothing else. 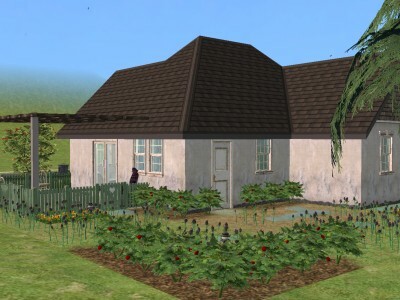 Upgrade the house with the most expensive stuff in ts2, with the earnings she / he will get from his / her job. But... I can't find the lot. Meh. You have to sign up in the fourm. Just a little note: the pile behind the sofa is poor Jack. He was killed by flies. Your sim won't be able to sweep it up, you have to turn on move objects and delete it manually. The pile is Jack. Creeeeeeepy! OK once we complete the challenge, can our person get married? I've been thinking about trying a challenge for a long time, and I like the sound of this one.. Especially since it doesn't involve 4+ sims which I'm not ready to take on all at once yet. Under the 5th picture there should be something that says Download to the very right. Can you all find it? I started this last night and my ultra neat virgo hated the place. It was kinda funny to see her cleaning up everything and I do mean everything. So far though she's only had enough money to change the kitchen since she hated that the most. Struck by the fears that have chased me since childhood. I stumbled, crawled and learned to walk again. This is such a fun contest! I moved my guy into the place, and the first thing he did was sigh and make an ugly face when he walked into the house. Haha its gonna be som much fun seeing how he handles the place. My girl, Chyanne Viho, decided that she didn't like the imporvements to the kitchen after all. She promptly passed out from all the cleaning she was trying to do on her first day in. I just gave her free will and left her alone for the first day. The second day she got a job, 1 point in charisma and 3 in cooking. By her third day she got her first promotion and was really excited, she then promptly passed out, again! On her fourth day she brought a new friend home and they connected instantly. She also gained another point in charisma and gained 2 points in cleaning. She took a break from work on her fifth day, mainly because she thought the exterior needed some work. She was pruning and pillung weeds. Poor girl she passed out yet again. The sixth and seveneth day nothing happened but her going to work. However by the eigth she decided she wanted more to eat than what she could cook, she set her eyes on the lobster thermidor. She was watched the Yummy Channel for almost 4 sim hours. Talk about boredom, however that boredom went away when I saw a cute townie outside the door. They hit it off immediately and decided to email each other everyday. I'm now on day ten, and she has a lovely white and yellow kitchen and the tv area of the living had been redone because the stupid tv kept breaking. If I remember, I'll take some pics or Chyanne. HI, I'm Chyanne Viho and I'm a neat freak. Sad, but oh so true. When the real estate agent showed me pictures of the exterior of the house I feel in love with it. I just knew I had to have it, unfortunately she refused to show me the inside. It was horrible! I wanted to cry but being the neat freak that I am I cleaned it all up. Yes, even the poor ashes of the former owner. As you can see I've already started the remodeling process. Nothing really expensive yet! Soon, I hope. I can't show you the bedroom or the bathroom yet! Those rooms still need a fresh coat of paint and I'm just too tired right now. My nightly emails to Jeremy, I asked him over tomorrow night for dinner. I hope you can come because I really want to show off my new kitchen. I think the style is called quaint. I don't really know I got the desk, chair and bookcase out of the value section at Simmington Furniture. The sales lady was not very nice as I didn't have enough money for the high end stuff. Oh, you caught me. I can clean a clean counter all day. I'm just putting my house in order before tomorrow night. The first date is always the hardest. He wanted to go to this fancy resturant but I can't afford that! So, home it is and I'm a decent cook! Henry was a dear friend of my father's before he passed away from a heart attack. I guess when you lose the family fortune and the IRS takes everything to take everything to pay back taxes, I guess something's gotta go. It's been two years so I've had a lot of mourning time. Now, however I'm just a little irate. I could've been living a life of luxury not one of paycheck to paycheck. Henry's sweet! He checks up on me from time to time and occasional brings over pizza and chinese food since I really can't afford all that yet. I do a little painting on the side for Simpora Galleries. They showcase new and up coming artists. 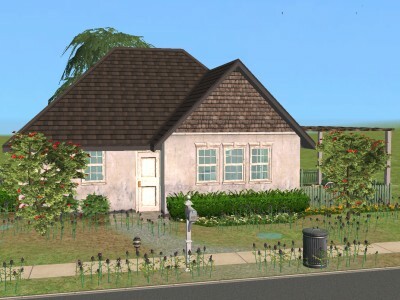 Of course the 500-800 simoleons per painting isn't bad either. Although, I've only sold two. People just don't know art, anymore! On my way back from shopping! Grocery shopping, I wanted to cook Salmon and aspargus tonight for my big date. The truck came with the house, I can't wait to trade it in for a newer model car. Plus this thing is really horrid on gas. Three twenty five a gallon and it's a twenty gallon tank. Uhggg! We really have a lot in common and the date went really well. He asked me out for next week, his treat. We'll see how it goes. Of course I think he was trying to get an invitation to move in, but I politely told him thaat I had to get my house in order before I would take on a roommate or any kind of mate. It made him frown a little, but I think he'll get over it. Well, I'll try to write more when I have time, but alas the gallery wants three more paintings and I'm working for Logistic, Tech. It bites to be in the business world when I want nothing more than to paint the day away. Note: The date really did go well and now both of them want to get engaged. Argg! I hope it's okay that I used custom content but I hate using the value stove, fridge and dishwasher with the quaint counters. Looks great so far! I just started mine today too, and Im loving it I cant wait to read more of your story. I've never done a challenge before but I'll do this one. EDIT: Boolprop, I can't find the download link. There should be 5 pictures of the inside of the messy house. Under the 5th picture, there should be a box which has the download button on the far right. Can you find it? I have to register? Eh...I'll pass. boolPropped: I'm wondering if I should move Chyanne's story to the froum story. One because I really love this challenge and two because I don't want to spam the board with my all my pictures. I have several more for the next chapter. Ok, I edited it down picture wise. My talent for stories flew out the window long ago. Well, I finally finished the bathroom with my big promotion check. I'm so happy because that built in wall shower was driving me to distraction. I finally got one room with all expensive things. Ack, only the kitchen, living room and bedroom to go. Oh and the outside. Aw, man I just realized how much work I had left. I seriously need a break. I had a few hundred simoleons left over from this weeks paycheck so I treated myself to a new hairstyle and clothes. I guess you know what that means. It's time to call up the girls and head downtown. Ugh, unfortunately I still have that cruddy truck. "Hey Hey we're the Monkee's and we're just Monkeyin' around!" Well, it's not the best tune but it'll work. I gathered up a few of my girlfriends and we headed to the Hidden People NIghtclub. Unfortunately Katie and Tess didn't feel like dancing so they headed upstairs and left me and Maggie to make a fool of ourselves. Friends gotta love 'em, but sometimes you really wanna kill 'em. I eventually made my way upstairs, where I found Katie and Tess playing poker with this slimy dude. I figured why not and bought some poker chips and waited to be dealt in. Katie already had a serious pile by then, maybe I can hit her up for a new vacuum. The slimy dude finally left abd Countess Nicola Nanale took his place. She's got a serious poker face and after losing a hundred simoleons I bowed out. I can't believe I lost that much. There goes food for the week, not to mention gas. Arrgg, I wanted to scream. After Katie left, I decided to try my luck again.Yay! I won two hundred back. I think lobster is in order, but that can wait. It's getting really late and tomorrow is Friday night, my second date with Jeremy. I think it's time to go while the goings good. I cashed in my chips and headed for home. Aw, six am already. I just went to sleep. Tonight's my date with Jeremy! Oh, I have a lot to do before I'm ready. I have to clean the bathroom, make the bed, dust the living room and mop the kitchen. Where does all the time go, before I know it it's six pm already. Jeremy's going to be here any minute. 7:05 pm. Jeremy's late. I hope nothing's happened. I guess I should call him up. "Hey, there gorgeous! I know I'm running late but I promise to be there soon." Hmm, odd I could have sworn I heard a female voice on the other line. Nah, couldn't be, could it? Note: I had to cut it short, because the date itself is also a few pictures long. On second thought maybe I should move this to the story forum. *shrugs* Nah, yea, nah.